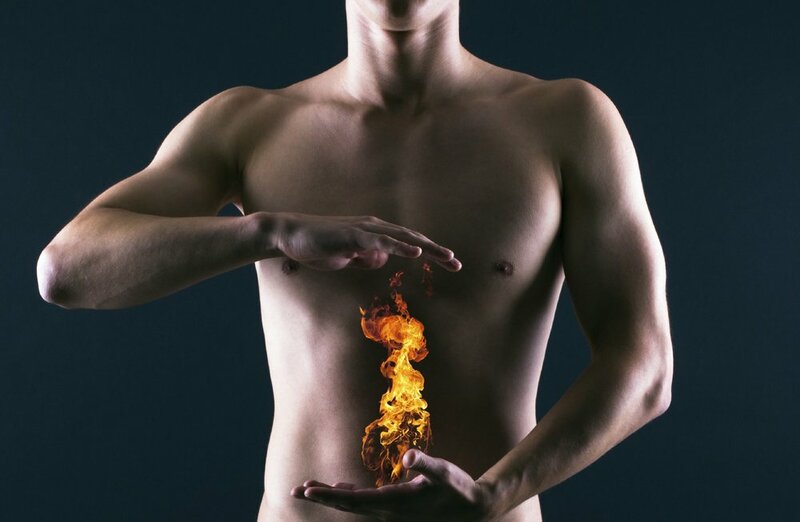 Dig deep into the story of agni, the fire behind all metabolic processes in the body. Visualize agni as a little burning flame behind our belly buttons. In the morning, agni is just waking up and pretty small (envision: teeny little cute flame, yawning, blinking eyes with outstretched arms). The goal is to help agni grow bigger. If we wake up hungry, we want to give agni just a little something warm to work on because agni is not ready for a heavy breakfast. It’s too little. A big meal at this time would squish agni and put it right out. Let’s think of the small, warm breakfast as kindling. Kindling makes a small fire grow larger. If we put a log (bacon, eggs, hash browns, orange juice, pancakes) on a small fire, what happens? The fire goes out. If we are hungry, we should have a small breakfast which is manageable for agni to digest so that it can grow. By 10 a.m. when pitta energy kicks in, we might feel a little snacky. That is because pitta, the sun, and agni are all getting stronger, which makes us hungry. The goal is to have a nice raging agni fire by noon. Around noon we should eat our biggest meal of the day so agni has the rest of the day to digest it. Because our digestive fire is strong at this time, it can handle a bunch of work. As the afternoon goes on, agni is working hard on digesting our big lunch. At the same time, the sun is getting lower in the sky. By dinner time, agni is not only tired, but does not have power and heat like it did at noon. This is why Ayurveda says to eat a small dinner. Once the sun goes down, the heart closes like a lotus flower and the normal functions of the body reduce. Agni too curls up with a blankie and rests for the evening. When it wakes up the next day, the cycle starts over again. WHERE OUR WESTIE SCHEDULE GO WRONG. 1) We skip breakfast or have a cold, raw smoothie. Or yogurt with fruit. Fire can’t grow if we throw cold goop on it! 2) We eat a light lunch like a salad. Agni needs substantial fuel to get us through the rest of the day and a small salad ain’t enough. 3) Because lunch was tiny, we are starving by the time we get home so we inhale a big dinner and go to sleep. The problem? With a large meal at night and a shrinking agni, the big dinner will sit in our guts, undigested, until agni has enough energy to work on it again the next day. Most people will eat breakfast on top of that undigested food which makes it twice as hard. Over time, this creates an old food pile that never gets processed. With all that undigested food, we’re quickly on the road to weight gain and ama (toxins you will learn about shortly). Bright side! With simple commitment this can all be changed. Let me give you a real life example. At our jobs, we complete the bulk of our work during the day. Imagine if we came home at night to find even more work than we’ve had all day, to be completed between 7–10 p.m. We would be like, “Forget this.” And we would quit before we start — it’s just too much to accomplish in a short amount of time. Agni feels the same way. Monica Bloom grew up in Milwaukee, Wisconsin on beer, cheese, fried things and Green Bay Packer football games on Sundays. She currently works a job-job with a 2.5 hour daily commute in tech-crazy San Francisco. She comes home to an endearing husband, a spritely toddler, two dogs and a cat. She practices daily meditation, exercise regularly, and has been actively sharing Ayurvedic wisdom through her blog, heymonicab.com, since 2008. She has become an expert at tucking Ayurveda neatly into modern life. Check out her newly released book, In Your Elements: A Blooming Ayurvedic Guide to Creating Your Best Life.